Let the Games begin!!! This week I read the conclusion to THE HUNGER GAMES series. And let me say: beware of the jabberwock! 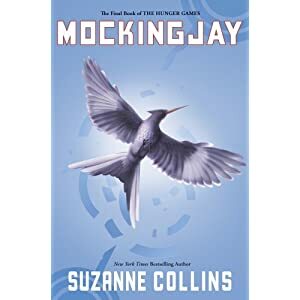 You’ll find this book much different from the other two in regards to Katniss and Peeta–Katniss isn’t the confident character we’ve come to know and love, and Peeta . . . well, I don’t wanna give anything away. Now I was kinda lucky in the respect I read the first 2 books in August after returning from my writer’s conference and hearing about the books in almost every workshop. Since the latest installment came out August 24th, I got it a few days later for my b-day & was very happy I didn’t have to wait long to read the last sequel. Mockingjay was similar to The Hunger Games and Catching Fire b/c all of them made me lay awake thinking about them, but this one for very different reasons. The first two installments made me think of Africa. I don’t know if anyone else made this connection, maybe it’s just me ( it often is;) Let me do a quick summary if you haven’t read these books (GASP, what’re u waiting 4?!) The setting is N. America in the future . . . but it’s not called the USA anymore. It’s the country of Panem with 13 outlying districts outside of the Capitol. You’re not free to leave your district, which are guarded by Capitol “Peacekeepers” and each district is responsible for a specific trade to support the Capitol (in Katniss’ District 12, they are miners). The farther you get from the Capitol, the poorer the districts become. B/c at one time in their history, there was a rebellion & the Capitol won, the President hosts a Hunger Game each year to remind the districts you don’t cross the government. Every kid aged between 12 and 18 has their names entered into their district’s lottery & one girl and one boy is chosen to compete in the annual Hunger Games, where the contestants must fight to the death in a Capitol designed arena and is aired on live TV 24/7. Only 1 is allowed to survive, until Katniss enters the arena (again, I don’t wanna give too much away). I just started reading The Hunger Games and know I am going to like it. Thanks for letting me borrow it. Oh man. I can’t wait to read that book. Jamie!! !1 don’t say another word until I read it. I just finished that one too! Sounds like I will have to borrow that from you.